UMBC men's hoops, a team that went 4-26 last year in the America East conference, has no business hanging with a team, even a subpar one, from the mighty ACC. And yet, last night, I saw it live. 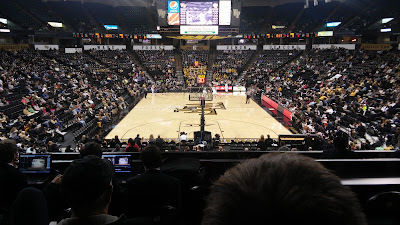 My daughter and I went to see the ol' alma mater play Wake Forest for the regular season opener. I had absolutely no expectation for a victory for the reason stated above, but damn if my first institutional love didn't lead me on. Despite the expected mismatch - and to be clear, Wake had some key cogs out of the night's matchup, it was a game to the end, including a few Retriever leads deep into the 2nd half. The Dawgs were ultimately overwhelmed and fell 78-73 in Winston-Salem. On a night where quite a few mid-majors got victories over major conference foes, it's tough to think about what could have been. While I was pleased with our overall play, I was infuriated by our free throw shooting - just 12/25 from the line. The points we left at the stripe could have won us the game, even if Wake would have made all of theirs. Wake's pep band, who I was directly across from, was enjoyable as always, though I feel as though the game schedule didn't give them as many chances to play as it could have. Being out that way, I realized how often I've been on Wake Forest's campus for sporting events, and it's always been rooting against the Deacs. I've got nothing against them, but their role as a destination is simply that of "where I can go see my team locally." No hard feelings, Wake.